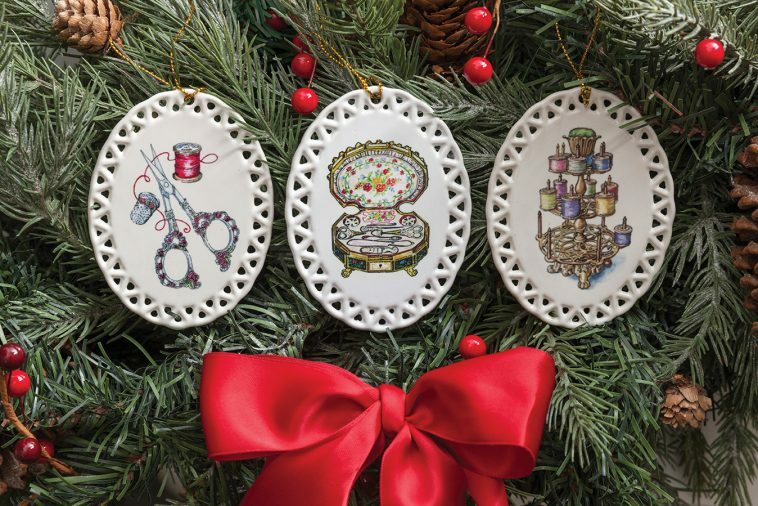 For three years in a row, Classic Sewing magazine has released an annual Christmas ornament featuring the exquisite and delicate artwork of Judy Jamieson. And I am excited to announce the gorgeous 2018 addition! 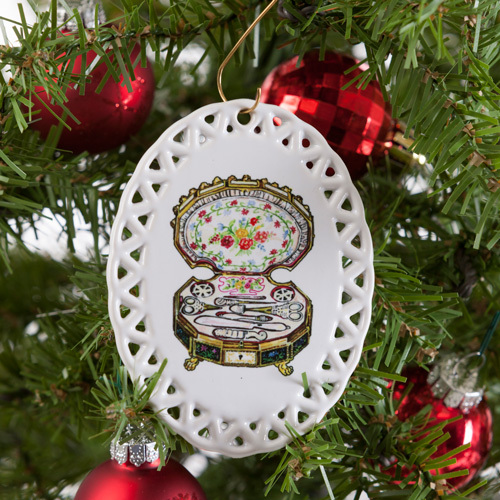 Judy’s artwork is displayed on a glass china ornament with a dainty lattice edge that mimics lace edging in many of the sewing projects that I love. I could go on and on about how much I adore this collector’s item. Judy’s talents are remarkable, and I am thrilled that we get to play a part in sharing her work with others who love to sew, collect, and decorate, of course! There is just something special and unique about being able to put a name and a story behind a product. I’ve written before about the collection of silver jingle bell ornaments that Neal and I have been adding to since we were married. The excitement and joy of unpacking our collection year after year never gets old! I know we are talking about ornaments, but I think tradition in general is why this time of year means so much to people. There is great comfort in returning back to certain places or practices year after year. And from now until the end of December, we get to do just that! Whether it’s tailgating or tree trimming, we all have our autumn and holiday rituals that add to the anticipation and splendor of these few glorious months! Please tell me about a tradition you have during autumn or the holidays! To shop this year’s ornament, click the image below! I love the idea of ornaments with classic sewing themes! Readers with an interest in vintage fabrics and antique sewing tools might want to look at the website of Mama’s Miracle Linen Soak (mamasmiracle.com). If you then click on Our Favorite Ideas, and then on the Antique Sewing Tools board, you’ll find hundreds of photos showing everything from needle cases, pin cushions and thimbles to intricate scissors and chatelaines. These are the tools our grandmothers and great-great-great grandmothers used to make the heirloom stitchery we treasure—it’s a fascinating subject. My husband and I have been married 46 years. Through the years, a fragile little bird nest has graced every one of our Christmas trees. My dad and I found this bird nest on a hike in the range of hills on his cattle ranch when I was a teenager. It gets more delicate every year but has stood the test of time and it represents a precious memory. Near it I always place one of the 6 tiny pinecone birds purchased in August, 1972 in the Black Hills on our honeymoon. I have a wire tree upon which I hang ribbon angel ornaments I’ve made over the years. I have a little wire tree on which I hang ribbon angel ornaments I’ve made over the years. I collect so many things it is sort of hard to choose one to highlight! But, for the Christmas holidays, I put a little tree up on my island in the Kitchen and I hang my copper cookie cutters on it. I like to bake goodies to give away, but I no longer bake the cut-out cookies! Those ornaments are beautiful. I would hang them on a door knob or even on the wall in a sewing room so they could be admired all year long. As for traditions, well, I always play my grandfather’s favourite song , Autumn Leaves, on the piano in September, his birthday month . And as a Canadian we have already celebrated Thanksgiving with all the trimmings. We definitely make day trips to pick apples and go ” leaf peeping” when we can. Last year we went to the Finger Lakes and the colours were spectacular. I also celebrate American Thanksgiving as a nod to my paternal grandmother…the parade is always a highlight! So many traditions, so little time. I love fall! The house is always decorated for Autumn and Halloween. We have a little party on Halloween. We make orange jell-o and have orange soda,too. We have a cake or cupcakes and make cookies. This Christmas I an staring a new tradition to go with our usual ones. I purchase a small artificial tree for the kitchen. I am going to have a gingerbread theme tree. We give each other a lot of books. We save the books to open on Epiphany night. That way we can enjoy the opening of the books separately and not rushed with the other gifts on Christmas day. I like to decorate the entire house for Autumn and Halloween. I always make sure I order my Peeps candy,since I cannot not eat chocolate or nuts. Christmas I always put out the Manger and help put up the tree. We always put out our stockings to be filled with little trinkets. For Autumn we always decorate the house and eventually Halloween,too. We do a little decorating on the front of the house. For Christmas we always purchase a live tree that goes to the ceiling. I love the smell of a fresh tree.